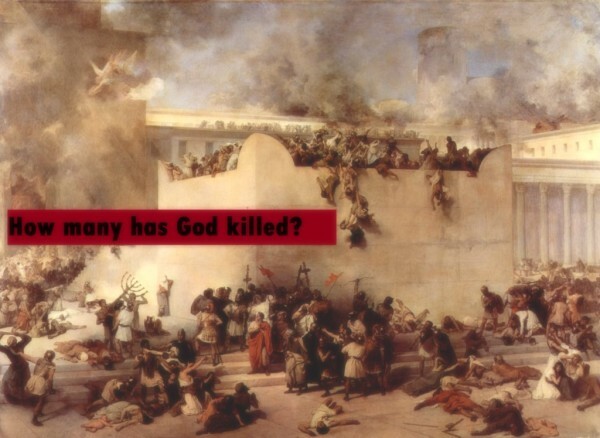 How many people did God kill in the bible? The loving and merciful god of the bible left a fair amount of documentation about how many people he personally killed. Some of it must be intuited as the accounts don't give specific figures. Someone provided a figure using rough estimates and a fair breakdown on this web page and arrived at a figure of 33,041,220 people. This is a high estimate and others estimate a much lower figure of 2.8 million. How many people did Satan kill in the bible? It appears that Satan only killed 10 people: the seven sons and three daughters of Job.And he only does this because god allowed it as part of a bet!. Technically the blood is on god's hands for these as well. Who, how, why did god kill people in the bible? I've listed and counted God's killings in the Bible. But I only included those that said exactly how many were killed by God. I came up with 2,476,633. But that didn't include some of God's most impressive slaughters. How many did God drown in the flood or burn to death in Sodom and Gomorrah? How many first-born Egyptians did he kill? The Bible doesn't say, so there's no way to know for sure. But it's possible to provide rough estimates in order to get a grand total, and that's what I'm attempting here. Total with estimates: 25 million. The table shows two numbers: the number given by the Bible, if any, and an estimate, when no biblical number is available. His breasts are full of milk.--Job 21:24 . 1:12 And the LORD said unto Satan, Behold, all that he hath is in thy power; only upon himself put not forth thine hand. So Satan went forth from the presence of the LORD. (1:13-19) To start off God and Satan's gruesome game, Job's slaves and animals are burned to death or killed with swords. Then Job's children are killed in a windstorm while partying. (1:13) "There was a day when his sons and his daughters were eating and drinking wine in their eldest brother's house." (1:14) "They have slain the servants with the edge of the sword." (1:16) "The fire of God is fallen from heaven, and hath burned up the sheep, and the servants, and consumed them." 1:18 While he was yet speaking, there came also another, and said, Thy sons and thy daughters were eating and drinking wine in their eldest brother's house: (1:18-19) "Thy sons and thy daughters were eating and drinking wine in their eldest brother's house: And, behold, there came a great wind ... and they are dead." (1:20-22) God kills (or allows Satan to kill) Job's children, but Job doesn't "foolishly" blame God. (1:20) "Then Job arose, and rent his mantle, and shaved his head, and fell down upon the ground, and worshipped." (1:21) "And said, Naked came I out of my mother's womb, and naked shall I return thither: the LORD gave, and the LORD hath taken away; blessed be the name of the LORD." (1:22) "In all this Job sinned not, nor charged God foolishly."